Your menu is one of THE most important aspects of hosting a successful Super Bowl party! It’s our nations second Thanksgiving! Sure, it’s a day for indulgence, but we can indulge in a less glutenous way! Check out my post (HERE) from Friday where I featured my favorite guilt free recipes, including some MAJOR dessert recipes that will blow your mind! If you are looking for more recipes, check out my post from last year HERE and my Gridiron Eats magazine HERE. 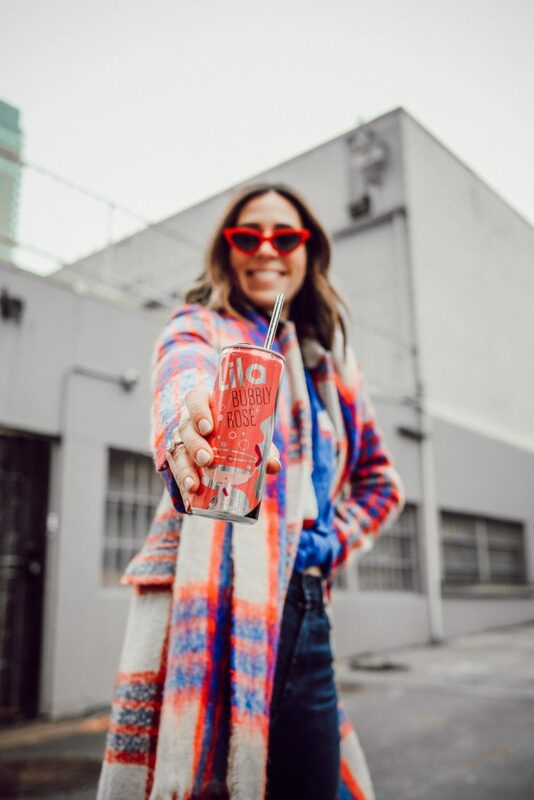 Super Bowl Sunday is all Bloody Mary’s and Beer, but Lila Wine has changed my perspective on that for good. Why, who doesn’t like bubbly on a Sunday and there is zero clean-up! Lila Wines is a high quality canned wine with a variety of blends. They are a super convenient way to enjoy wine and are low in calories and carbs! Bonus, they contain NO added sugars – YAY!!! 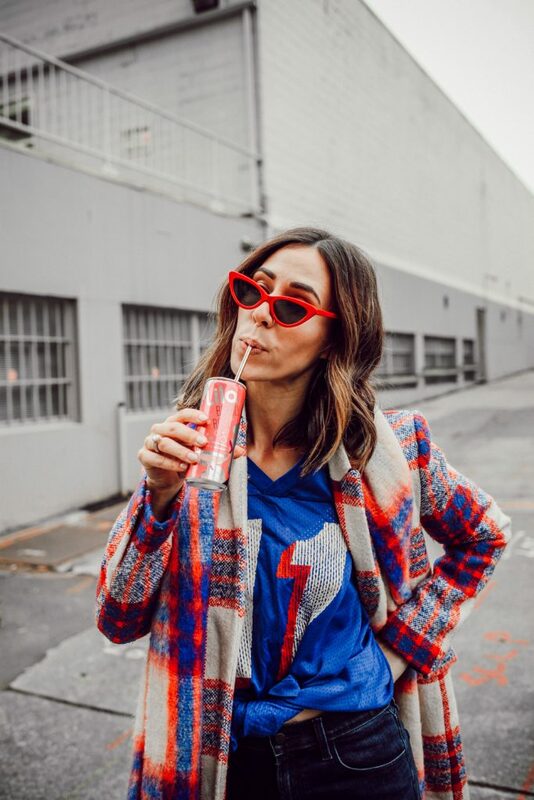 For this Super Bowl, I’ll be serving up the Lila Bubbly Rosé and the Sparkling! Want to add Lila to your Super Bowl spread, check them out here to find a retailer near you! 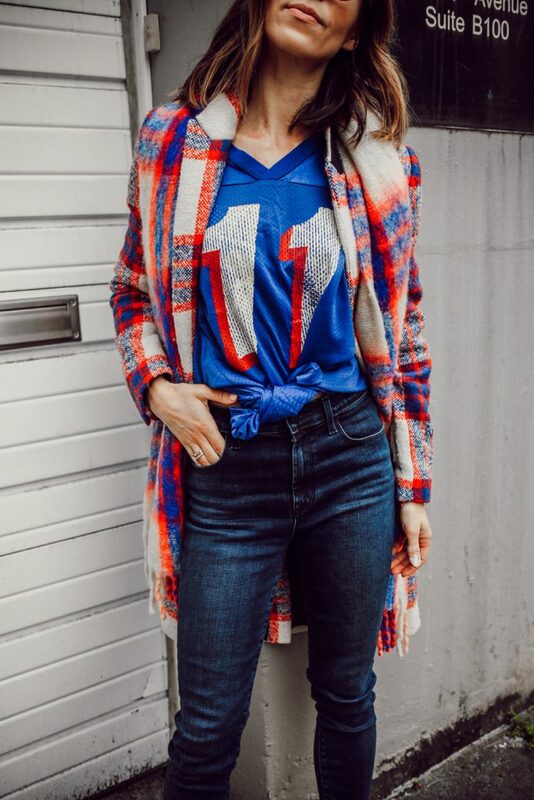 HERE is a fun way to layer your favorite game day tee! To keep warm, style your game look with some faux leather pants like THESE. I love adding fun little twists to my game day spread, whether it’s mini foam fingers for your straws or drawing plays on your placemat! There are so many fun DIY ideas you can do at home without breaking the bank. One of my personal favorites is using white tape to draw football lines on glassware – it’s super easy to do and adds a fun element to the party! OR use a mini megaphone over your floral arrangement to truly tie in the theme! For more inspiration check out THIS post on Super Bowl Sunday recipes and and easy DIY decor for your party! 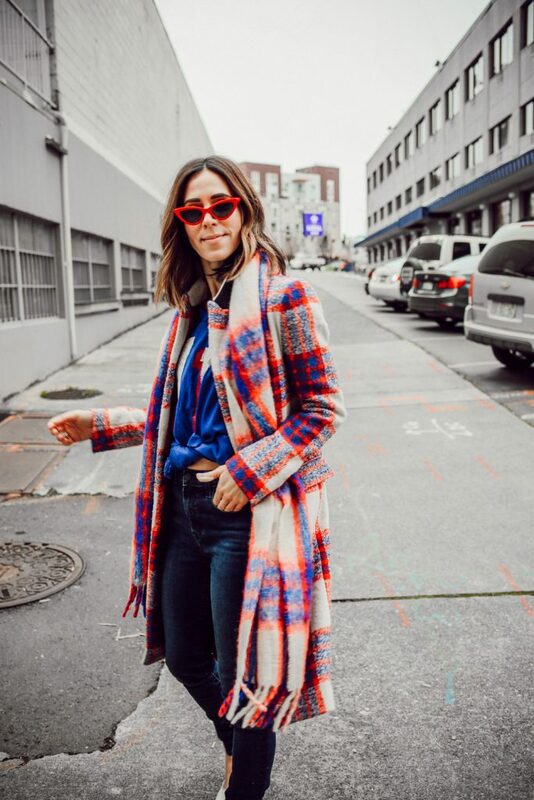 Checked Coat // The coat that I’m wearing in this post is from Zara a few years back – the coat sold out like hot cakes, BUT I found three very close seconds! 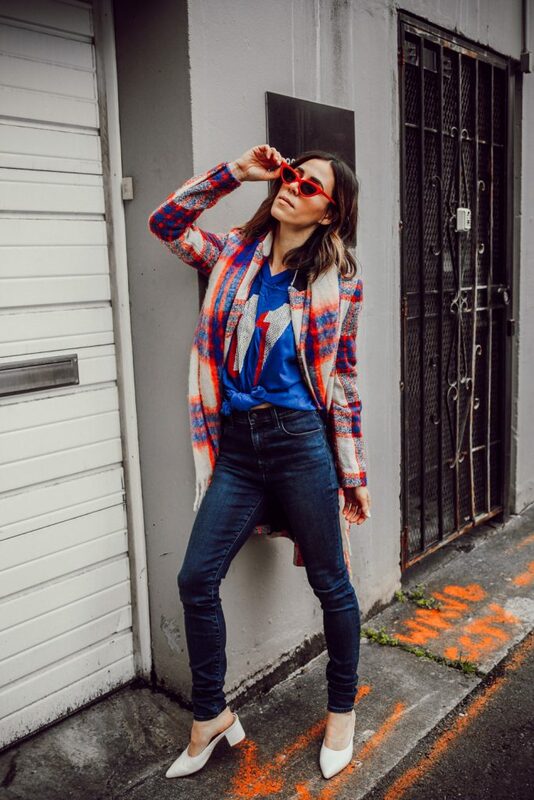 This checked coat is more red based and is currently under $100! Here is a white based version that is $41 – it’s more holiday, but could double as a something for game day! And, how fun is this version (it’s more expensive than the others), but I love the green accents! Vintage Patriots Jersey // This jersey has been in my Super Bowl rotation for the last 5 years!! Thank you Tom Brady for allowing me to save money and wear the same jersey year after year 🙂 My White Mules and Cat Eye Sunglasses are the perfect accessories for this New England Patriots look! J.Brand Jeans c/o // I styled the look with these “Photo Ready HD” jeans from J Brand. During Super Bowl Sunday there is one major component that you need in your look – STRETCH! These jeans give me all the suction and all the stretch at the same time! They are super comfortable with the perfect amount of give in the waist line. The wash is super slimming and really helps to elongate my 5’5 legs!